During my family reunion I had a number of people address my weightloss and the ‘how did she do it’ conversation happened often. My answer is always the same- lifestyle shift focused of healthy eating and lots of movement- but one question caught me off guard: how much raw food do you eat? I think a lot of people confuse the wide variety of fringe-ish healthy diets and kind of lump them into one vegan/raw/vegetarian/paleo combo! It is true- I take pages from all of these dieting theories and combine them into my own little food pyramid, but the raw question actually got me excited. I answered, upon a little reflection, that I probably eat about half of my food raw… Then I kept watching my food intake to see if I was actually accurate or if I over-inflated my rawness prowess. Guess what? I observed that I actually eat more than half of my food raw. That was a pretty awesome discovery. One of my goals this summer was to try out different eating philosophies. I wanted to try a raw food week, to follow a macrobiotic week, to be vegan for a week, but maybe it’s ok to adopt things partially, like I already seem to be doing with the raw. I am pleased, beyond measure, to realize the natural shift that has happened in my/our family diet. I read online, recently, about how those little baby carrots that are ready to eat are actually treated with chlorine to keep the bacteria away. I intended to do more research, you know, to determine if this was a Facebook meme or truth, but in the meantime, we switched to eating carrot sticks made from whole carrots in our home the old fashioned way. I didn’t need to do any research, though. We had forgotten what real carrots tasted like! 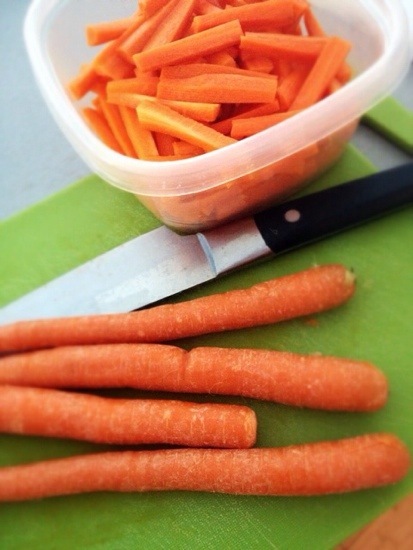 It turns out, carrots that we cut at home don’t need to be drenched in ranch dressing to cover up the lack of flavor! Carrot sticks, in fact, are so sweet and tasty that we eat them without anything. This was a nice rediscovery! We’ve also gone back to just cutting carrot sticks the old fashioned way. And I buy the organic carrots because they are not that much more money, but they taste better.